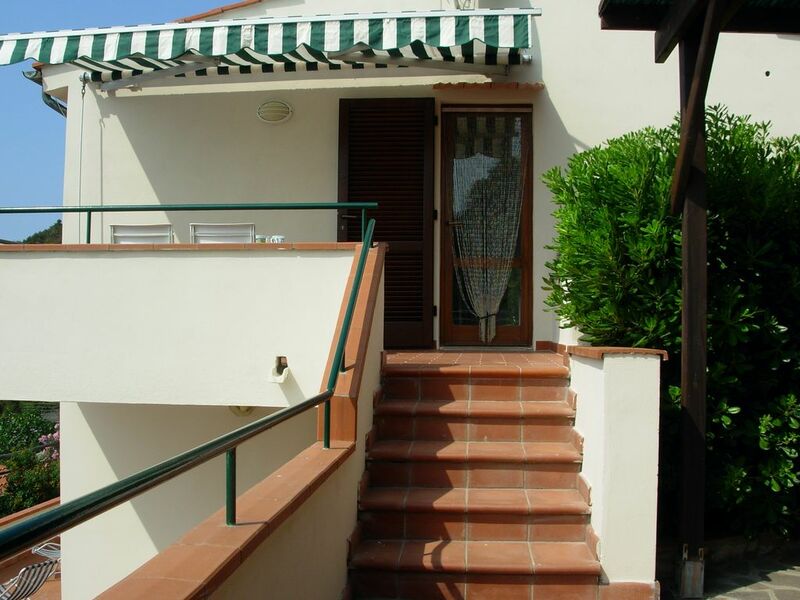 The property consists of an apartment and an outbuilding (ref. Announcement 8552334), independent of each other that can be rented separately or as a single solution for groups of 6/8 people. Apartment and annex (ref: 8552334) are surrounded by nature and enjoy a splendid sea view and, on clear days, you can see Corsica. From the three terraces, furnished for lunch / dinner outside you you can admire enchanting sunsets and magnificent starry night. The apartment is located on a high floor, consisting of dining room / TV room, kitchen, shower room and two bedrooms: one double and one with bunk beds. The annex is a two-room apartment consists of living room TV and dining room with kitchen, bathroom with shower and bedroom. Availability of two parking spaces. In 5 minutes by car, you reach the beach Chiessi (15 minutes walk) pebble and granite cliffs. For those who prefer sandy beaches only 10 minutes drive away is the bay of Fetovaia and 20 minutes to fine sandy Cavoli. Pets Allowed. Nearby convenience store and restaurant / pizzeria. Wir hatten eine sehr schöne Zeit in Casa Belvedere verbracht. Linda und Roberta waren sehr freundlich, zuvorkommend und hilfsbereit. Die Ferienwohnung entsprach dem, was man auf den Fotos zu sehen bekam. Die Wohnung ist gut für die Selbstversorger ausgestattet und sehr ruhig gelegen, ein Auto ist lebensnotwendig. Naheliegende Strände und Einkaufsmöglichkeiten sind mit einer kurzen Fahrzeit zu erreichen. The house is situated in an oasis of peace in the small village "The Pigeons" which is 1. 8 km from the center of Chiessi. The location is ideal for those who want a relaxing holiday in contact with nature.